Zebralight SC30 & H31w (1xCR123A/RCR XP-E) Reviews: RUNTIMES, BEAMSHOTS, and more! 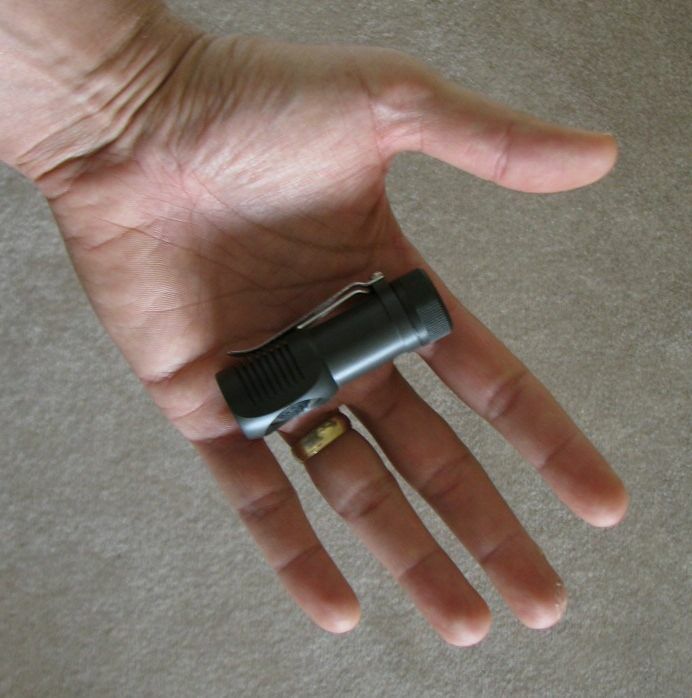 Thread: Zebralight SC30 & H31w (1xCR123A/RCR XP-E) Reviews: RUNTIMES, BEAMSHOTS, and more! 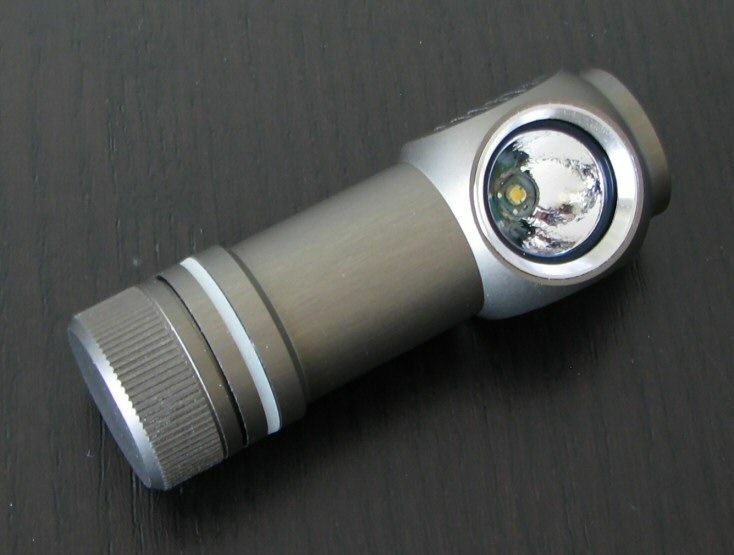 Reviewer's Note: The Zebralight SC30 and H31w were provided for review by GoingGear.com. Manufacturer Specifications: (taken from the Zebralight website). Light output are out the front (OTF) values. Runtime tests are done using Panasonic CR123A lithium batteries. Runtimes are usually much shorter with rechargeable RCR123 (16340) batteries, especially with protected 16340s that have higher discharge cut off voltage. Battery: One CR123A lithium primary or RCR123 Li-ion rechargeable. Batteries are not included in the package. Proprietary heat sinking design bonds the LED metal core board directly to the uni-body aluminum casing, providing unblocked thermal paths to over 92% of the surface area. Zebralight now makes a number of lights in different formats. 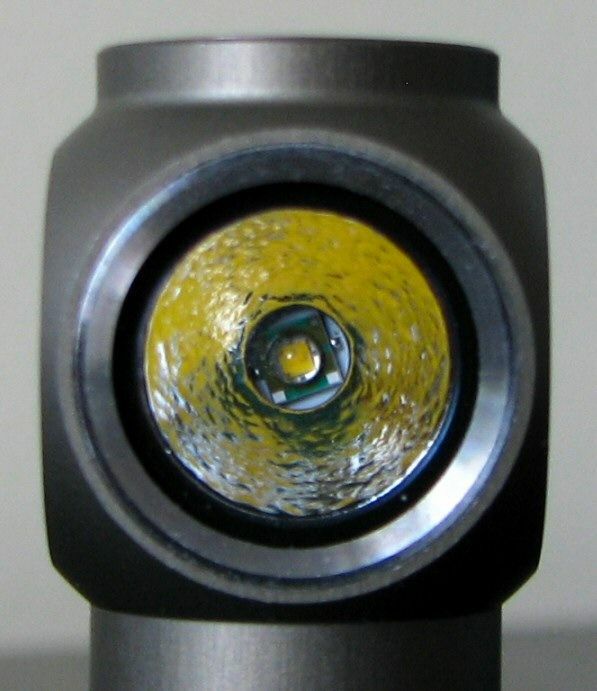 Reviewed here are a couple of lights in the 1xCR123A/RCR form factor – the side-projecting 90 degree headlamp form (H31) and a standard forward-projecting flashlight form (SC30). Both lights include similar circuits, and both come in cool and relatively “warm” tint options (using Cool White and Neutral White emitters). For this review, I am testing the standard cool-white SC30 and the neutral-white H31w. For all pics below, the SC30 is shown first. For the SC30, you will find the light with removable clip (attached) and a good quality headband with soft plastic attachment. On the back of the package are instructions for use and specs. I presume the H31w is the newer “eco-friendly” packaging (i.e. cardboard box). Inside is the light, headband with soft plastic attachment, extra o-rings (including extra GITD one) and a pocket clip that attaches through a rubberized section. Also included is a one-page instruction sheet, but this doesn’t seem to be specific for the light (i.e. no model specs given). Overall dimensions are pretty comparable – it is really just the angle of the head that differs. The lights are pretty small for this class, especially considering the electronic control switch. 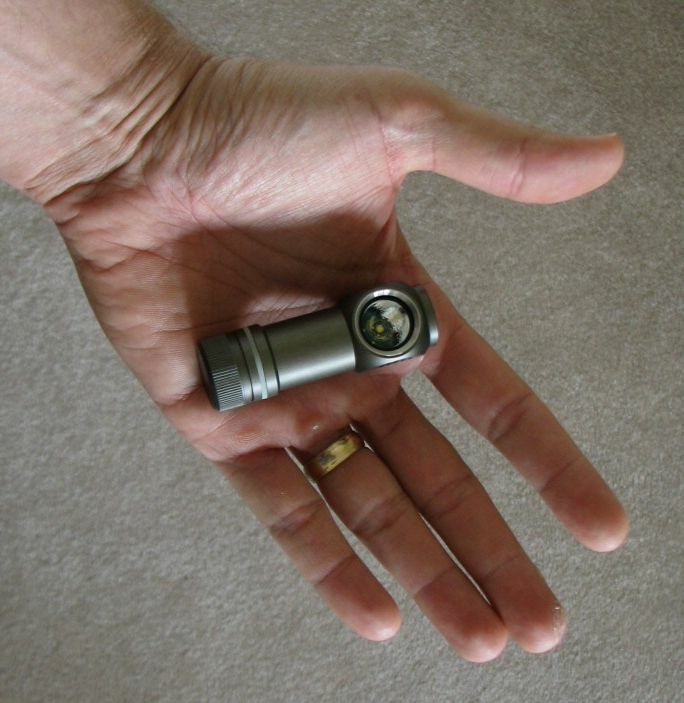 Zebralight is using modern XP-E emitters for these lights. The output and tint bins are not specified, but I understand from Zebralight that the recent Neutral white emitters have been 5B4 tint bins. 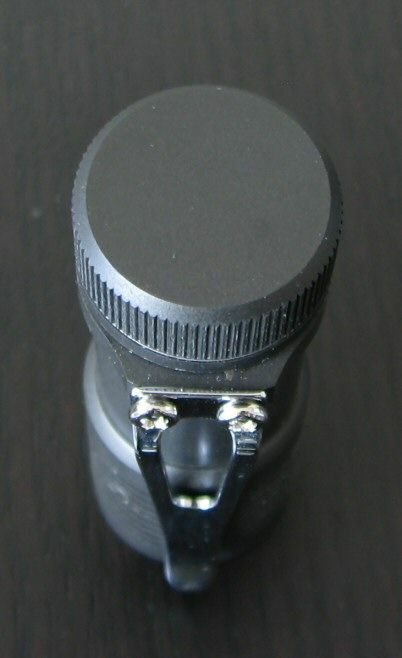 Reflectors are lighty textured (light orange peel), and a reasonable depth for this size light. An interesting feature – the lights can head- or tail-stand, in either form. Both lights have flat-bottomed tailcaps and electronic control switches on their heads. The switches are covered with textured boot covers, and are easy to access. Feel of the switches are good for this type, with a lightly audible click as you make contact. Note that electronic switches are not like traditional mechanical clickies – think more like the buttons on your DVD player, flat-screen monitor, etc. 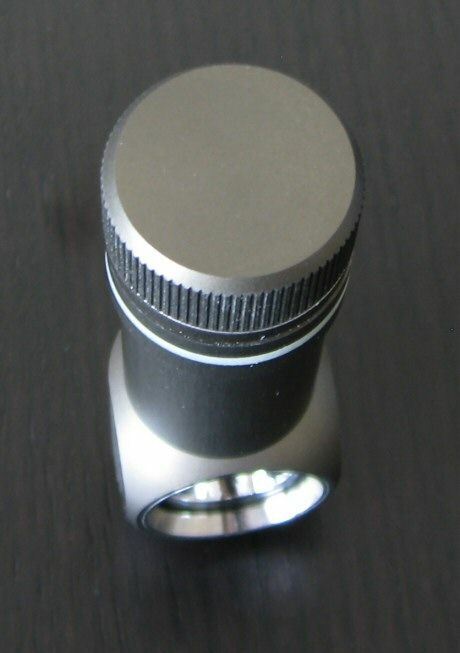 Tailcap threads are anodized, allowing for tailcap lockout. This is important on all lights with electronic switches, since there is always some parasitic stand-by current drain to allow the switch to function. Scroll down for a discussion in this case. 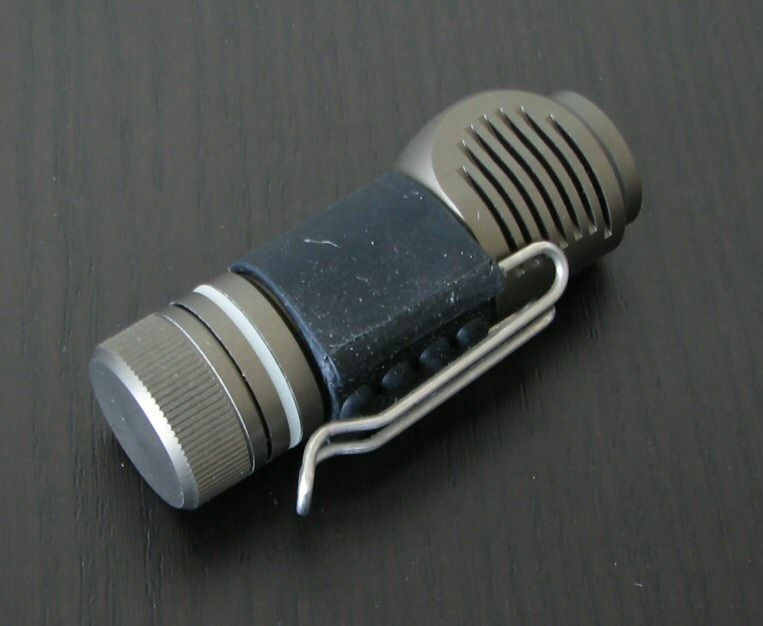 The SC30 light comes with a removable metal pocket clip, held in place by two regular Phillips head screws. 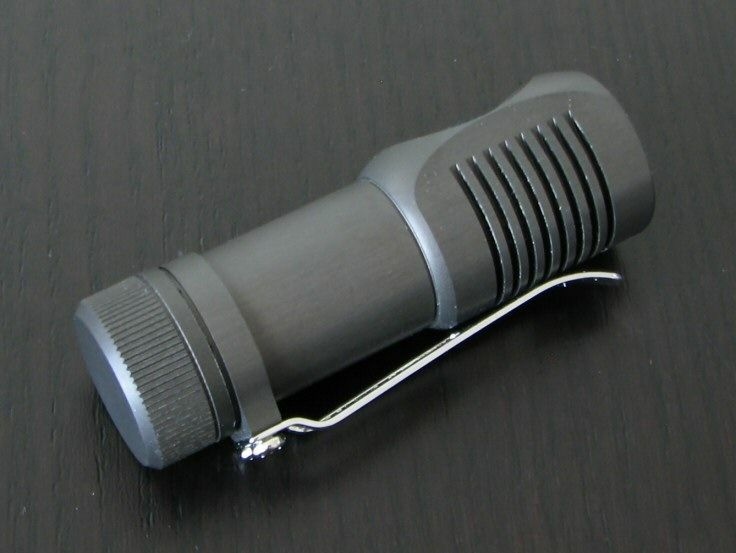 The H31w has a metal and rubber pocket clip that can be slipped over the body of the light. 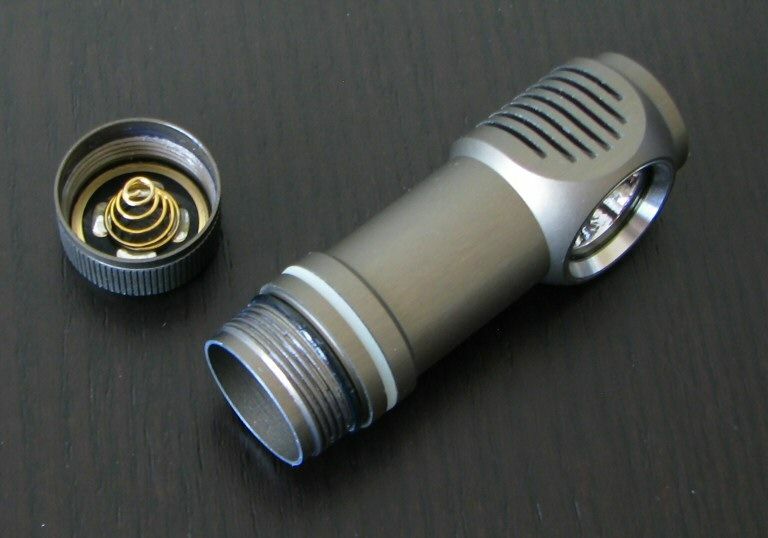 The H31 also has a removable GITD o-ring installed around the body, near the tailcap. Fit and finish on my samples are excellent. 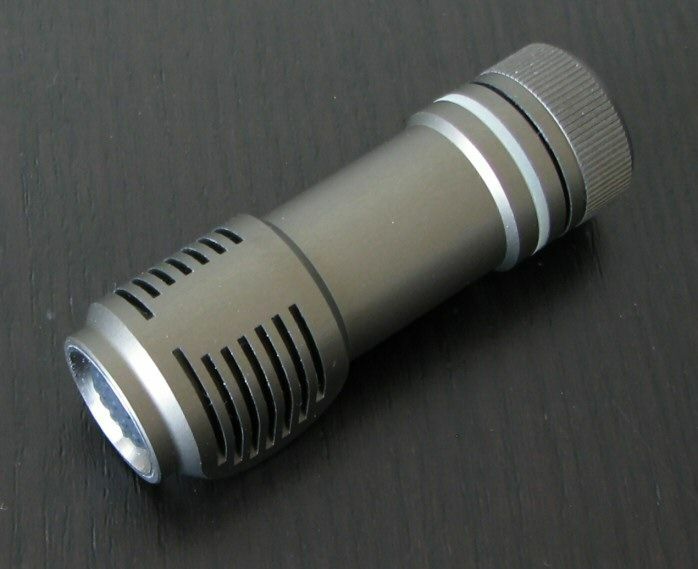 I really like the colors – the SC30 is a darker gray, and the H31w is more of a green-gray. I suspect this is just anodizing batch variation (I am currently testing a Zebralight SC50 which is intermediate to these two). But in all cases, the tailcaps are well-matched to the bodies. 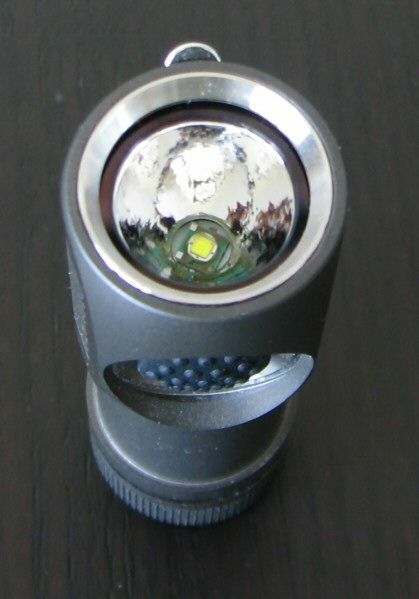 The overall effect is very similar to a number of Nitecore, JetBeam and SUNWAYLED lights. I would consider these Zebralights to be in the same category as those makers. One interesting feature – absolutely no identifying or warning labels of any sort on either light. Kind of a refreshing change, to be honest. 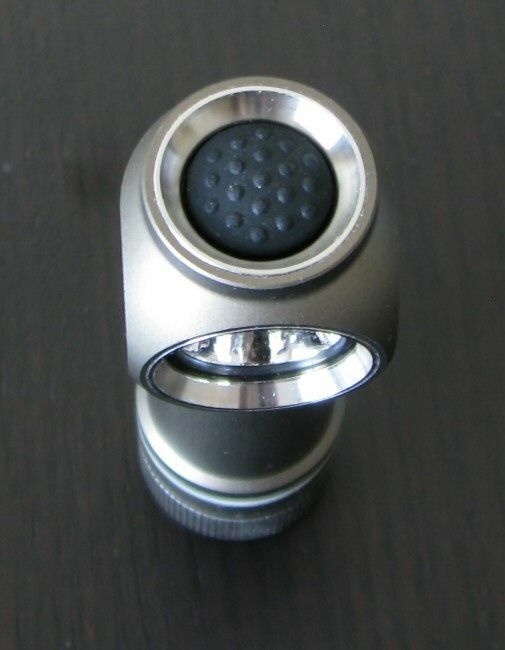 There is little ridge detail or knurling, so I recommend you keep a clip on these lights. The heatsinking fins around the head do provide some additional grip, though. One last point: the included headbands are good quality, and hold the light well in place. I consider these an improvement from the original headband (where the light had a tendency to slip if moving quickly). 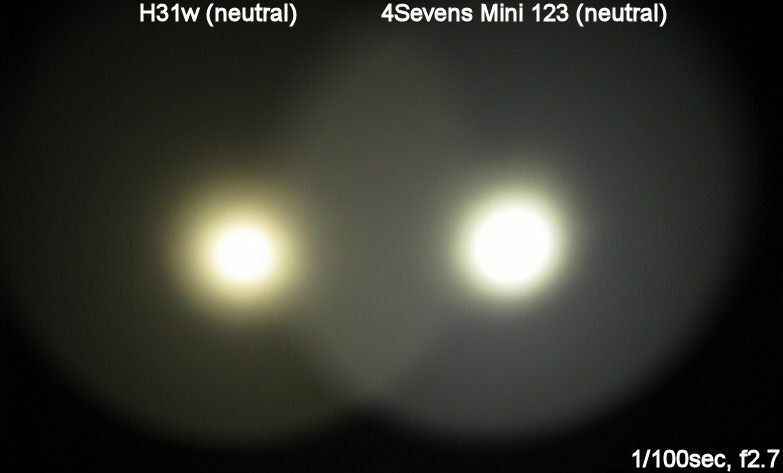 To help you compare beam profiles and tints, here are some up-close shots comparing the Zebralights to the 4Sevens Mini 123 series. All lights are on Max, ~0.5m from a white wall on primary CR123A. The camera is set to daylight white balance (~5200K). As you can see, beam profiles are very similar – which isn’t surprising given the same class of XP-E emitter, and similar size of the reflectors. 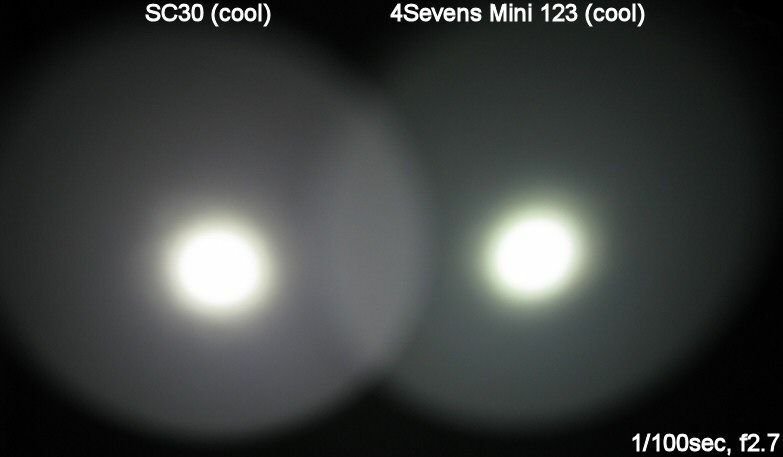 Tint on my SC30 (cool white) is a bit on pinkish side, compared to the slightly greenish 4Sevens Mini 123 (cool white). This is just tint lottery – you gets what you gets. 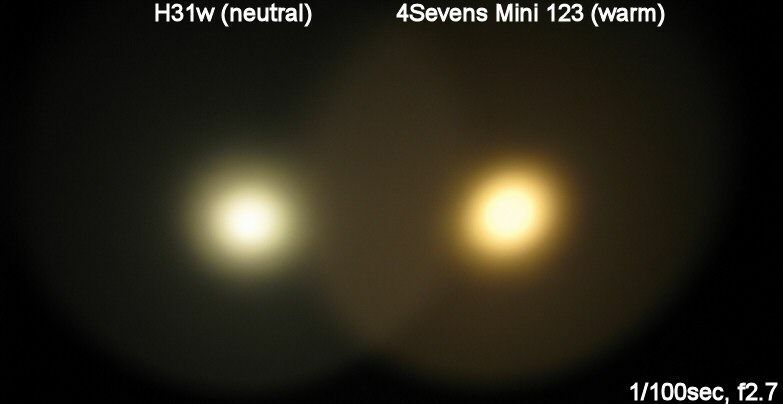 For the H31w (neutral white – presumed to be 5B tint), you can see tint is a bit warmer than the 4Sevens neutral white (4C/4D estimate), but not as warm as the 4Sevens warm white (7A/7B estimate). The Zebralights have a fairly unique user interface. While it may sound a little complex when first described, it is actually quite easy to use. Both the SC30 and H31 function the same way. On/off and mode switching is controlled by the electronic clicky switch. There are 6 possible output modes on either light, arranged in two sets of 3. Each output set is Lo – Med – Hi. The difference here is that there are two possible outputs at each level, referred to as 1 or 2 (e.g. Lo1, Lo2, Med1, Med2, Hi1, Hi2). The light has independent mode memory to recall your preference at each of the Lo, Med, Hi levels. 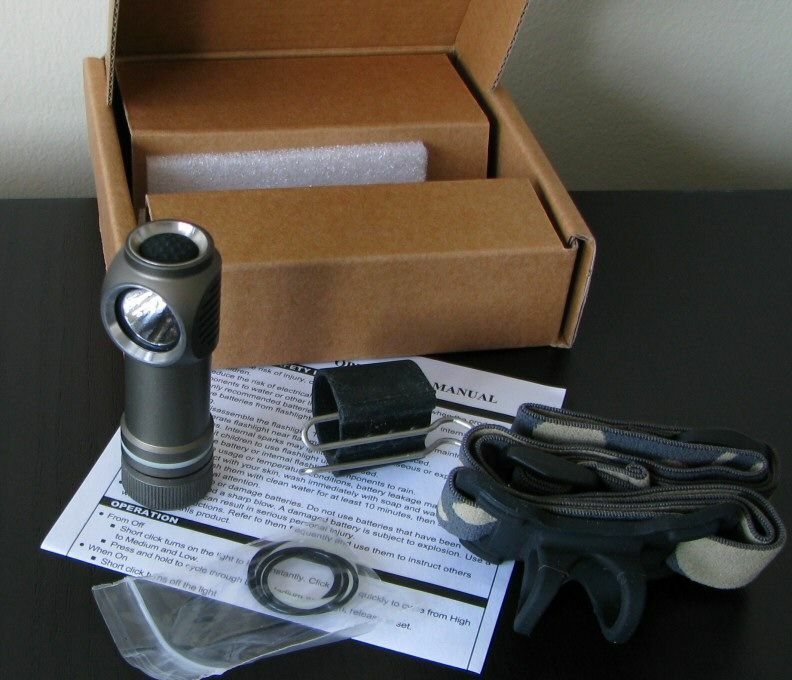 For example, I like leaving my SC30 set as Lo2 (0.4 lumens), Med1 (38 lumens), Hi1 (193 lumens), but you can customize yours however you like. From Off, a quick click turns on the light to your preferred Hi instantly. Click quickly again to cycle from Hi to Med, and Low. You need to perform these clicks rapidly if you want to switch modes this way (i.e. from Off, single-click is Hi, double-click is Med, triple-click is Lo). After about a second or so of being On, a quick click will simply turn the light off. Alternatively, from Off, a slightly longer press and hold (i.e. >0.5 sec) turns on the light to your preferred Lo mode. To advance from one mode to the next while the light is On, press and hold to cycle through Lo, Med and Hi, repeatedly (you can do this directly from Off too). Release the switch to select the level. As before, a quick click turns off the light. Double click at any level to toggle between the two sub-levels for that level (i.e. 1 or 2). The light will memorize your choice and return to it next time you cycle or turn on at this level. The memory even lasts through battery changes. And that’s it – it is really very simple. Once you get used to the timings, you can basically have the light do anything you want, with your preferred Lo and Hi being the most directly accessible from Off. There are no strobe mode on the SC30 or H31. 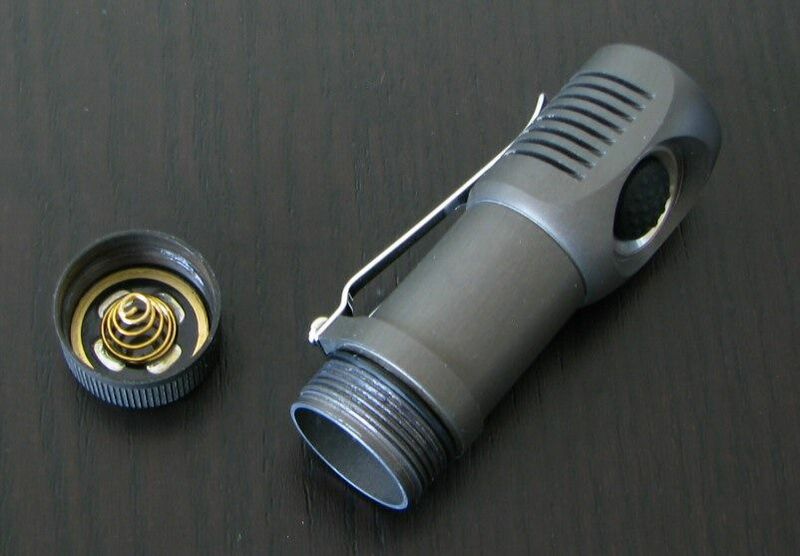 Zebralight uses PWM only for the lower levels at each output mode (i.e. Lo2, Med2, Hi2). The higher levels seem be current-controlled. While the Med2/Hi2 level PWM is high enough not to be very noticeable or distracting in every day use, the Lo2 PWM is visible. This may be an issue for those who are sensitive to it. Looks like Zebralight’s published specs of 3 years standby current for these lights is pretty accurate (based on CR123A). FYI, they seem to have improved these currents considerably on the SC50w I’m currently testing (i.e. greater than an order of magnitude lower currents). Hopefully this trend will continue for them on future lights. Throw values were taken at 1 meter for all lights shown below. As expected, the two lights generally perform similarly – when you take into account that neutral white emitters are typically lower output bins compared to cool white. Although Zebralight doesn’t provide exact bins, this general relationship holds within a given emitter class (as the neutral/warm whites are made by adding more phosphor, which lowers luminus flux efficiency). The other thing to note is a little oddity – both lights have an over-discharge protection (ODP) circuit, but this gets triggered on the SC30 with primary CR123A cells as well as RCR. I presume the SC30 is an earlier circuit, and this quirk was corrected on the updated H31. (i.e. there’s no need to shut-off a CR123A cell). Not really a big deal though, as you can still switch into the Med/Lo modes for further runtime on the SC30 once the Hi mode shut-down point is reached. Although not shown, I tested an unprotected RCR in both lights, and got comparable patterns to the protected RCRs shown above. A nice undocumented feature. How does it stack up to the competition? 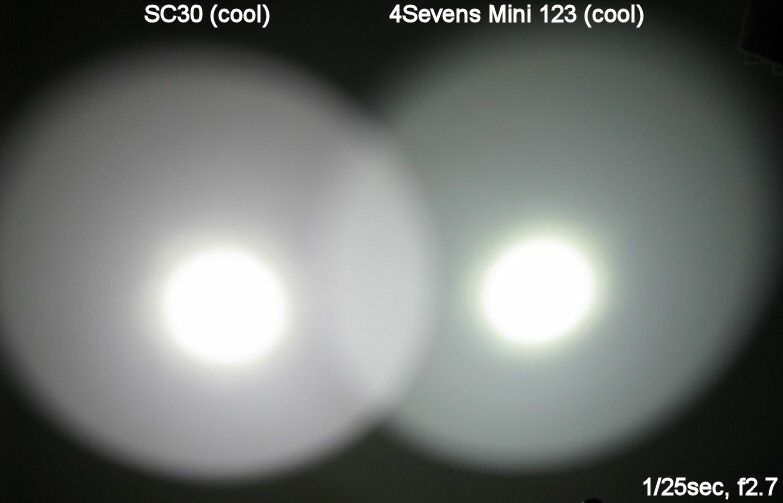 I’m only showing the SC30 (cool white) below, to keep this consistent with the other lights (which are all cool white). Runtime performance is very good on Hi - and excellent on Med. Based on this, I would expect the SC30 is running at least an R2-output bin. And as you can see on the Min output graphs, the relative output level of the Zebralights on their lowest setting is very low. And no, I won't be doing runtimes at these levels. The SC30’s over-discharge protection (ODP) circuit is also triggered on CR123A at the point where it would begin falling out of regulation. But you can still illuminate the light at a lower level for extended runtime at this point, so it is really only a minor annoyance. This oddity is not present on the (presumably newer) H31. There is a quirk on my H31w where the Hi mode memory is not kept. The light always defaults to Hi2. The lights use PWM for 3 of their output modes (the lower level at each mode - i.e. Lo2, Med2, Hi2). PWM freq is noticeable at the lowest level (~120Hz). Parasitic standby current drain needed for the electronic switch will exhaust a protected RCR in just over a year, and a primary CR123A in around 3 years. But the light can be easily locked-out by a twist of the tailcap, if this is a concern. 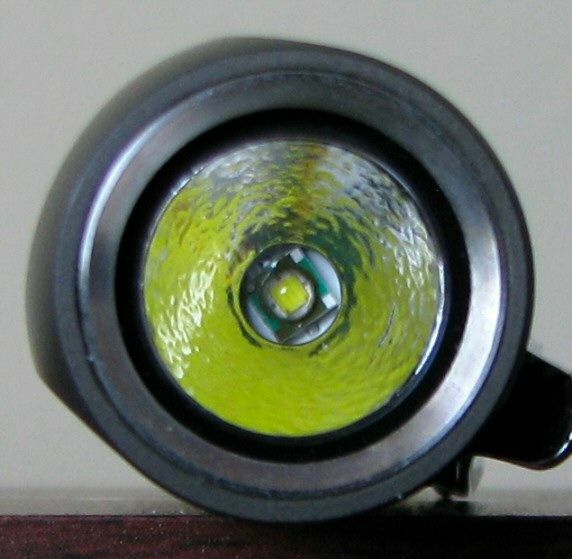 It’s been a long time since I’ve reviewed a Zebralight product – their original 1xAA H50 headlamp model, in fact. I’m impressed with how the products have continued to evolve since then. The SC30 and H31 represent two sides of the same coin – would you like the light in side-projecting 90 degree headlamp form (H31) or in a forward-projecting standard flashlight form (SC30)? 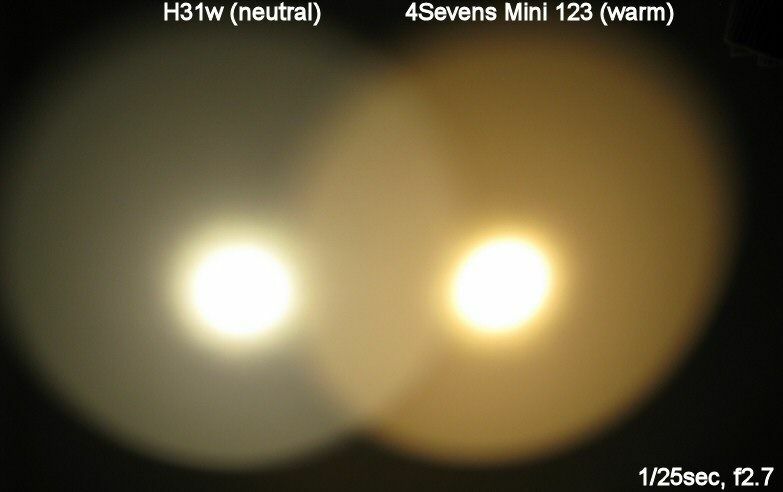 Both lights include similar circuits (although the H31 seems to be revised to remove the primary cell ODP “feature”), and both come in cool and relatively “warm” tint options (using Cool White and Neutral White emitters). Reflectors and emitters and otherwise identical, so you can expect comparable beam profiles. Circuit performance is very good - PWM is used for only the low level of each mode (i.e. Lo2, Med2, Hi2), whereas the higher levels seem to be current controlled. PWM freq is high enough not to be too noticeable on Med2/Hi2, but it is visible at Lo2. Output/runtime efficiency is excellent – I’m particularly impressed by the results on RCR. 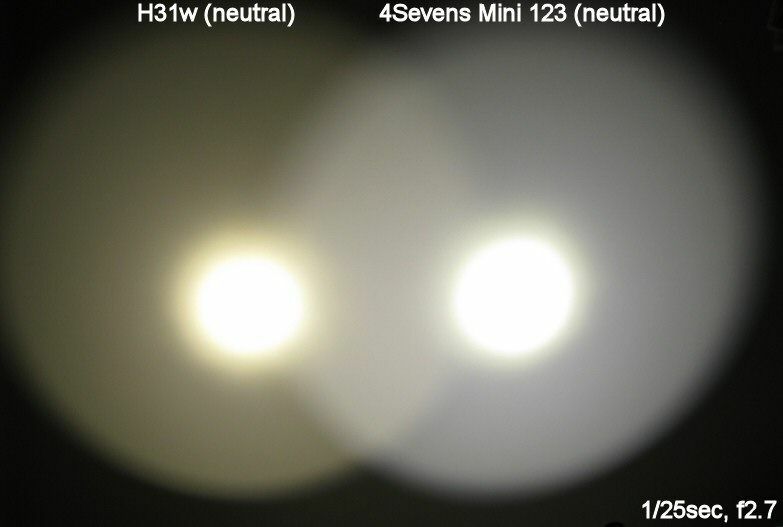 Although I haven’t tested the lower outputs, Zebralight’s published specs are close enough to what I found on Med/Hi to make me think they got this right (Zebralight claims testing on Panasonic CR123A, which in my testing usually slightly outperforms my Titanium Innovation cells). The user interface is distinctive – I find I quite like it. At first, it seemed a little complex for a 2x3-stage light, but it is actually quite intuitive once you get a feel for the timings (i.e. a quick click, versus slower press-and-hold). And still quite powerful – you can easily and quickly get to any level you want. The spacing of the levels is very good, IMO. I particularly like the "moonlight" 0.4 lumen low level (just wish it had a higher PWM freq - it's lower than the other 2 levels that use it, and quite visible to my eye). Build quality is also top-notch – the lights have a solid, well-made feel (remarkably so, given their small form factors). Frankly, these are some of the nicest lights I’ve seen in the small-scale 1xCR123A/RCR domain. I’m impressed enough by the build that I am currently EDCing the 1xAA Zebralight SC50w that I have also received for testing (a review of that light should be up in a few weeks). The build, performance, and interface of the SC30/SC50 family makes these lights very well suited for every-day-carry, IMO. UPDATE: My review of the SC50w is now up, and I can tell you that it has a much lower parasitic drain and a much higher PWM freq than the SC30/H31. Last edited by selfbuilt; 09-08-2010 at 02:00 PM. I have been measuring on some of the 6 levels Zebralights, half the levels are current controlled, the other half uses pwm. Nice review Selfbuilt! I really like the UI of the ZL's as well. I find that there is minimal if any delay in response time with the electronic switch, something I really appreciate. Ooooh man! I think you just broke my resolve Selfbuilt! Right - that explains what I was seeing around ~120 Hz on Lo2 and ~700-900 Hz on the Med2/Hi2 on both lights (i.e. the lower levels at each output mode). No signs of it on the higher levels. I've just amended the review text. I'll do proper oscilloscope traces when I get a chance. Last edited by selfbuilt; 08-21-2010 at 01:15 PM. Good stuff there! Thanks for the review. The only useful tool is the one you have with you when you need it. I was hopeful you would do another ZL review, great job. The only ZL I find myself seeing PWM is the H51 on low2, I have not seen it with the H31 (XP-G), SC60 or SC50(cool and neutral) so I'm not sure if it has something to do with the light's or me, I don't have the H31w to test against. Thanks selfbuilt hopefully this is the beginning of many more of the new Zebralight models that you will review. Thank you for that informative review, selfbuilt! I have an SC50 and will be looking forward to your review of that, as well. As always, a wonderful review. Thank you. P.S. : Although I'm still testing the 1xAA SC50w, I can tell you that so far, it has a MUCH lower parasitic drain and a MUCH higher PWM freq than the SC30/H31. Last edited by selfbuilt; 08-22-2010 at 11:06 AM. Excellent review as always. Thanks! I'm in as soon as the neutral-white xp-e is replaced with an xp-g.
Just updated the review with some experiences on using the headlight H31w version. Fortunately, I'm in the middle of doing renovations on my home, so it has provided a good opportunity for some field-testing. Frankly, the H31w worked better than I expected. As mentioned in my review, my favorite headlamp is my old 3xAAA Petzl Tikka XP (that I long-ago modded from a Luxeon 3 to an SSC P4). I like this light because its optic produces a very smooth and wide hotspot with the modded SSC (slightly wider than the H31), and it has built-in diffuser covers that you can slide over for full flood (for up-close work). So there is no PWM visible on L1? I really dislike PWM and that might be a deal breaker. Love the H31w but looking alot forward to the H61w! As always, outstanding review Selfbuilt! I bought an SC30 a little while ago and was a little hesitant about the electronic switch and UI, but all of my concerns were put to rest after using/carrying the SC30 on a regular basis. It's surprisingly small, bright, the UI is rather intuitive once you get the hang of it, and just seems to be very well made. thanks to self-built for another great pic-heavy review! 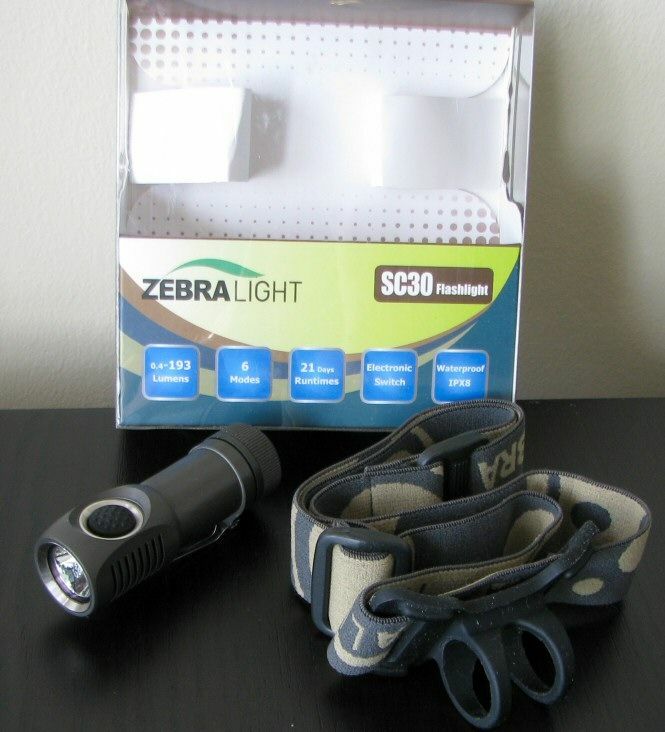 and thanks to goinggear for the review samples, its where i buy my Zebralights, among other things. my favorite is my h501w. 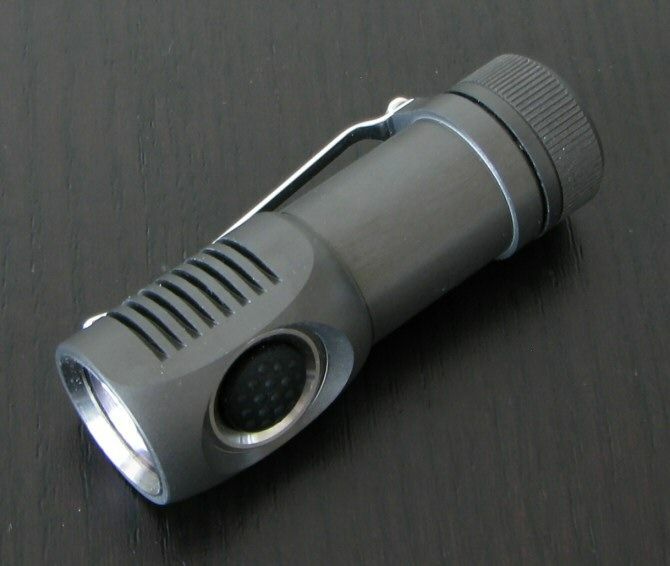 and recently got a sc50w as a gift, but i like it so much im keeping it, and will get him something else. looking forward to that review! Brilliant review and much appreciated to have confirmation that using unprotected RCR123A is possible without damage to the cell in the H31. I did find that on primary CR123A that if you switched the light off you could not switch it on again when the CR123A neared the end of its life with my H31. Same trait at the Surefire Saint but my Jetbeam RTT0 V5 torch proved that the battery Dracula lives at Jetbeam and managed a surprising amount of light from what the other two considered a dead battery. Due to muck up with AW rather complex range I have six unprotected RCR123A and nice to know that they can be used. Mine also remembers the H2 or H1 settings so makes me wonder if H30 electronics cross over with the SC30? Anyway thanks again, top stuff. I've been considering purchasing the H51Fw. I thought the flood version might be preferable for a headlamp, especially if I have another light with me for distance. It sounds as though you find the hotspot large and smooth enough that you don't feel the need for the frosted diffuser. I don't want to put words into your mouth, but does that sound about right? It sounds as though you find the hotspot large and smooth enough that you don't feel the need for the frosted diffuser. I don't want to put words into your mouth, but does that sound about right? That's a fair assessment of my experience. I haven't tested the newer XP-G lights, but suspect they would be floodier, and well suited for close-up work.